When a start-up presents a business plan, it’s the job of a savvy potential investor to poke as many holes in it as possible. They don’t need to figure out why they should risk their hard-earned, non-refundable money into your start-up business. You’re telling them why. What they’re trying to figure out is why not. They’re looking for the cracks, the pitfalls, the window their money is going to fly out of. Follow these tips for making your business plan free of the flaws your potential investors are so desperately seeking. Investors feel about start-up owners making a pitch how banks feel about citizens applying for credit cards—they care about your history, not your promises. A good idea—even a great idea—is a start, but it’s not good enough on its own. Running a profitable business takes ambition, good judgment, commitment, and work ethic. If you’ve displayed any of those attributes in the past, now is the time to bring it up. If you haven’t made a profit in business, maybe you have excellent credit. Maybe you’ve paid off your student loans early. Show a detailed, concise, and documented trail of your achievements and commitment to financial responsibility and the good character to do the things you say you’re going to do. Avoid jargon specific to your industry, and don’t use flowery, over-descriptive language. Be as brief and clear as you can in stating three overlapping concepts: what you’ve done in the past, what you plan to do in the immediate future, and how investors will benefit. Blustery language clouds—or has the appearance of trying to cloud—the facts and concepts you’re presenting. So many business plans come off salesman-y because the start-up’s pitchman forgets the most basic relationship he or she has with the potential investor: You’re not trying to get them to buy something. You’re offering them an opportunity to invest in something that will pay off in the long run. You wouldn’t be going into business if you didn’t believe in the service you’re providing or the product you’re selling. Tell them why you believe in it. The Small Business Administration is a governmental organization that advocates for small businesses, provides detailed information, offers advice, backs loans, and provides grants for entrepreneurs. They even have a section dedicated to teaching newbies how to write a business plan. All of this is also true when trying to get investors for an expansion—how do you think chains such as Bluegreen resorts got investors when they decided to open new locations? 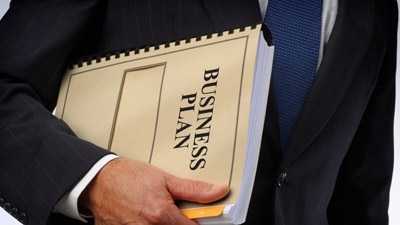 Your business plan is your business’s road map to success in the immediate future. Smart investors are looking for cracks. They have money to invest, in part, because they guard it carefully and don’t put it into frivolous endeavors. So make sure you give them plenty of reasons to invest! What did you learn from writing your first business plan? Janet Lilly is a full-time freelance writer who enjoys focusing on a wide range of topics. She specializes in small business issues and profiles of prominent industry leaders.